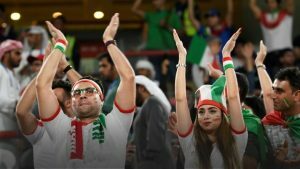 An expression of solidarity between supporters and players, the iconic slow chant — accompanied by a single clap in unison — has been adopted by fans of teams including China, India, Thailand, Lebanon and Iran. “Nobody does it like we do of course — but it’s really cool that more countries are using it to support their team,” Hilmar Jokull, vice chairman of Iceland’s noisy Tolfan supporters group, told AFP. “We’re just a tiny country in the middle of nowhere and we’re not expecting anyone to copy us — especially countries of more than a billion people. Their passionate fans also won admirers around the world, although — whisper it — the thunderclap actually originated in Scotland, and supporters of Icelandic side Stjarnan pinched it after a Europa League game in 2014. For Iceland supporters, particularly Tolfan’s “ultra”-style fans, the thunderclap is a serious business, expressing the Icelandic concept of “samheldni” — which combines elements of unity and cohesion. Thai fan David Prasong thought the thunderclap came from the Queen song “We Will Rock You” — until corrected.